In the verandah of the house nestled among coconut palms, sits an elderly man surrounded by men and women gazing at him silently. His countenance is flooded with peace and love as if from a secret well of joy in his heart. He embraces each with loving glances, showering additional benevolence on men and children with soft caresses. Gracefully accepting offerings from the visitors with the eagerness and joy of a child, he returns a portion to them and distributes the remaining among others sitting around. This is the daily routine of Sadguru Sri Nannagaru. Nannagaru (Nanna - father; garu - respectful title) as he is called endearingly, is the beloved Guru and father-figure for thousands of devotees who throng daily at his home seeking peace and guidance, both spiritual instruction and also advice for dealing with life’s challenges. No one leaves dissatisfied, their doubts cleared and turbulence in their hearts quelled. A look is enough to lighten their hearts, and inspire courage and confidence to face the world and their inner struggles. 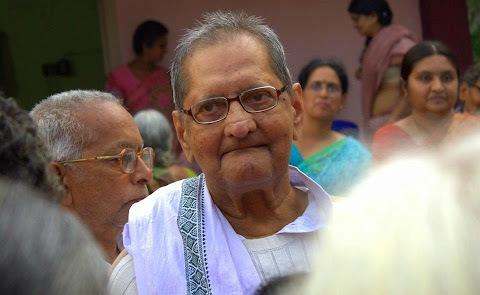 Born on 23 September 1934 in Jinnuru village, near Palakollu in West Godavari district of Andhra Pradesh, he had spiritual inclinations since childhood. In his early twenties, he saw an old man in a vivid dream whose overpowering presence remained with him even after waking. His quest to find this old man ended some months later when he saw a picture of Bhagavan Sri Ramana Maharshi. He immediately surrendered to Ramana and dedicated his life to him. Ramana took him into his fold though they never met in person. Since then his spiritual journey intensified and he remained firmly established in the Self and God Consciousness, while continuing his duties as a householder to perfection, keeping his personal needs simple and to the minimum. Over time, his spiritual radiance attracted seekers, who experience deep peace and joy in his presence. As devotees grew in numbers, he started travelling across Andhra Pradesh and other States reaching out to devotees, while also respecting his family’s privacy. Hundreds attend his discourses regularly in Jinnuru and other places drinking in his every word. Nannagaru frequently visits the holy town of Tiruvannamalai, where Ramana Ashram is located. Over the years his devotees established two ashrams to provide for seekers visiting this holy town – Andhra Ashram and Sri Nannagaru Ashram. 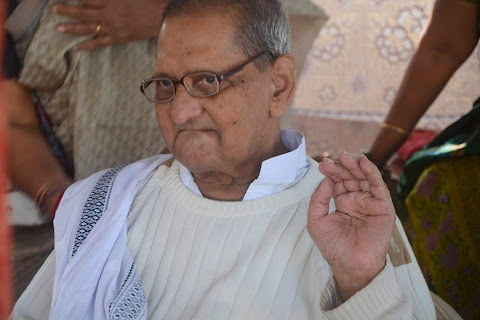 Nannagaru stresses on the purification of mind. Change should come from within to attain the higher states and real happiness. Your behaviour pattern in daily life is what really matters, he advises. Results are determined by the motive behind actions, and not the action itself. Our fundamental aim should be to overcome likes and dislikes. These are the cause of fear;and fear results in pain and grief. True happiness comes when we overcome likes and dislikes and accept every incident in life with calmness, equanimity, and a positive outlook. The course of life, including birth and death, are pre-determined but we have the freedom to choose how we handle each incident in life – with a positive or negative attitude – and use these as opportunities for self-purification and spiritual upliftment; while also achieving worldly success in the bargain! But then he says our destiny is made by us! Our fate is a consequence of past deeds. One should be alert and careful of every thought, word and action. You have to bear the consequences of not only what you say and do but of every thought that comes to you. The world he says is neither good nor bad; it is the way you see it based on your attitude. It serves as a mirror to show your faults and shortcomings; you have to make the effort and overcome them. True revolution does not happen from upheavals in society; it happens when each person strives to overcome his shortcomings and becomes pure and simple. Only that person can truly serve society. Good and bad deeds merely determine the course your life will take now and in future births. Good deeds however show you the right direction, while bad deeds distract you from the goal. To reach the final destination of Supreme Bliss and Awareness one has to rise above both good and bad. He extols holy company as they aid your spiritual practice and under their influence your path is made smooth and easy. He cautions against friendships that can ruin you and divert you from the right path. He gives equal importance to Jnanamarga (path of self enquiry) and Bhaktimarga (path of devotion). Bhakti is Jnanamatha (mother of jnana) he quotes. Jnana without bhakti (knowledge without devotion) is dry and tasteless. Only a true bhakta (devotee) can attain jnana. Courage is required to be a true devotee and constantly contemplate on God without a single thought about worldly matters. Like a leaf that trembles at the slightest breeze, if the mind is even slightly disturbed by one thought, true devotion is not possible. True bhakti ripens into Universal love. Only he with universal love blended with compassion, can truly serve God and humanity. While he focuses on Ramana Maharshi’s path of Self Enquiry and Bhagavat Gita, his spiritual instruction expands to include teachings of great Masters of all religions and faiths; including role models among social leaders and scientists. He gives us a deep insight into their greatness and contributions, inspiring us to reach the heights achieved by the great Masters and Leaders. He speaks the language of common man; the most profound philosophy and intricate spiritual concepts are made easy and followed even by the simple uneducated housewives in villages. The clarity of his instruction shows the depth of his understanding and wisdom. A true father to his devotees, he takes keen interest in their personal well-being and shares in their joys and sorrows. He guides them like any responsible head of a family - applauds their achievements, corrects their faults, and shows the right direction, expecting nothing in return. 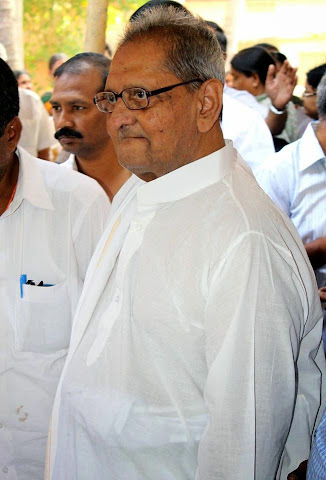 Nannagaru’s silence is however more eloquent than his words, and his eyes have the power to teach and reform. While his followers have an unquenched thirst for his talks, they hold his silence even more precious. Many have experienced the miracle of his silence when they found total peace in his presence, their sorrows dissolved and mind driven inwards, as exemplified by an incident witnessed by a western seeker. An old lady came to Nannagaru sobbing pitifully; totally devastated having lost her son. Nannagaru sat quietly through her outpourings of grief with a compassionate look. Gradually she calmed down, as he spoke a few words softly. In less than 15 minutes, she was totally relaxed and left with a smile - a miraculous transformation coming to terms with the worst tragedy for any parent. The immediate burning pain was soothed in Nannagaru’s presence, as naturally as a soft breeze blowing away a flame, giving strength and courage to overcome the deeper attachment and sorrow. He does not have to do anything, but just be there; and He has this effect on anyone who comes to him with a yearning – an automatic Divine action! The soft and warm rays of the morning sun glide over green tree tops on to the red tiled roof of the house nestled among coconut palms, and reach the open veranda (arugu) in the front of the house. An elderly man clad in white comes out on to the veranda and stands quiet and still for a few moments. He goes about his daily activities, his every movement calm and serene. He then sits in his usual chair on the veranda totally relaxed, a soft smile on his face as if a secret joy from within him is spilling over on to his countenance. A few women walk through the main entrance of his home and stand hesitant. He looks at them and his smile widens into open pleasure. He invites them with a gesture and they sit at his feet gazing at him, their faces flooded with happiness. More men and women come and sit quietly gazing at him. He looks around embracing each person with his loving glance. Men and children receive the additional benevolence of his touch; as he softly caresses their arms and back or cups their face with his hands and gazes fondly at them. Little boys in school uniforms come and wait. He glances at them, inclines his head and nods, a tiny almost imperceptible movement, and they silently leave having received their daily dose of grace and blessing. Some of the visitors offer him fruits and sweets; he accepts them gracefully, returns a portion to them and gives the remaining to the others sitting around. Someone brings a special offering from a holy place they visited, someone else an attractively wrapped packed of sweets or an expensive gift. He accepts them with eagerness and joy of a child as if he had been longing for it; examines each with a candid and child-like pleasure and asks questions about it with child-like innocence. Then with a huge smile, he gifts it to another among the persons sitting around, and promptly forgets about it as he turns to the next person. This is the daily routine of Sadguru Sri Nannagaru on the “arugu” (open verandah) of his home in Jinnuru. A couple of hours in the morning and late afternoon are allotted to his followers who come daily. For years, the “arugu” has been a silent witness to the words of wisdom that gushed forth through Nannagaru’s lips and to the radiance of love and endearment that spilled from his eyes and countenance. It also stands witness to the joys and sorrows of many who sought guidance and support to go forward. Devotees come every day to soak in his love and drink in his words; and they keep coming back thirsting for more. For them the “arugu” has no equal on this earth, it is heaven itself! On this arugu, seekers found direction and guidance, the troubled received solace, and uninitiated got their first glimpse of a new road to happiness. Prarabdha is the fruit of our past actions. It is something earned by our past work, our hard work and we have to experience it (enjoy it) wholly by our self. God’s constitution does not permit us to share it with anyone or escape it.Right from the first breath to the last breath in this body every moment is pre-planned, predetermined and pre-decided with respect to our body according to our destiny. So the present is on……but God has given us a wonderful boon of writing our own future. Present time is a white paper and our actions a pen which are going to rule our future in the form of prarabdha so, let us fill our present with divine thoughts,lovable words and the best actions possible which can make our guru feel proud of us.So,let us write our own future. In 1989 I was staying in Ramanashram in S.India and was told by David Godman, a long-time ashram resident, that a "very powerful teacher" was visiting the ashram. David highly recommended I see him. I initially resisted his suggestion as I was a student of another teacher at the time and felt no desire to go "guru-hopping". David urged me to re-consider, so I did. The teacher, Sri Nannagaru, was in a small room with only four other people present. I was invited to sit with him one hot afternoon. He asked me a few questions about where I came from etc. As he spoke, I could feel the atmosphere in the small room becoming "thick with a powerful energy". Then he looked directly at me and asked why I had particularly come to this ashram. I gulped and, totally un-planned, said, "To know God!" At that moment, I looked at the pupils of his eyes which seemed to move independently of each other at vast speeds. The impossibility of this physically happening was clear and at that point, my mind "burnt out", just dissolved. I found I was in a vast empty, white, shining field stretching for eternity. (You understand it is hard to verbalize this). Fear arose and I almost willfully contracted back into a more recognizable shape. Still feeling quite shaken, I bowed to Sri Nannagaru and, not having any gift to give, asked if I could send him something. He replied, "Send me a copy of The London Times". Which of course I did when I returned to the U.K. months later. For a long time I tried to rationalize what had happened. Hypnotism? Hallucination? Exhaustion? No explanation fit. My mind could not contain the experience. I felt, and still feel, no desire to run to be in Sri Nannagaru's physical company, (although I have seen him on a number of occasions in Tiruvannamalai) nor did I think the experience made me special or different from others in any way. 10 years later in London I found myself once again sitting in the company of Sri Nannagaru. This time there were twelve or thirteen people present. At one point, I was sitting right next to him on a sofa and as he turned and stared into my eyes, I remember thinking, "This time, I am ready". Once, a lawyer asked Bhagavan Ramana: "Which one is true? Only the major incidents of life like the birth, death, marriage, education are predetermined or every small incident of life is predetermined?" Bhagavan replied: " Every small incident of life is predetermined." Then the lawyer immediately switched off a table fan and asked Bhagavan: "Is this act(switching off the table fan) also predetermined?" Bhagavan replied: 'Certainly." Bhagavan Ramana said: " A film is already shot before being played in a theater. Similarly allour lives are predetermined before our arrival from our mother's womb. Therefore our lives resemble a cinema that has been already shot." Once, a lawyer asked Bhagavan Ramana: "It is said that everything is predetermined. However we hear several stories from the epics like a particular person performing a great penance and asking for a specific boon. Do such people attain anything new (which they are not destined to get) out of their penance? Bhagavan replied: "They ask for only such things which they are ordained to get as part of their destiny." After the war of Mahabharata, Yudhisthira asked Bheeshma: "Having killed so many people in the war, what should we do with this Kingdom?" Bheeshma replied, "This is only called as Destiny. How can you call it destiny if you know it beforehand?" Therefore Shakespeare said: “We are all but creatures of Destiny." We cannot say what is going to happen in an hour. It is because everything happens in its own time. Though, in a hurry to die, death doesn't approach you even a minute earlier. Suppose you have the desire to live more and the purpose for which the body came onto the earth is fulfilled, the death of the body happens as per God's will. It doesn't stop even for a minute. Even suicide is a part of destiny. It is the will of God that a particular body has to end in that manner. When and where the body has to take birth, the parents, relatives, enemies etc pertaining to the body are all part of destiny.Money, Scholarship, honor, power,and fame are all part of destiny. Whether the body has to be tall or short, whether it has to be black or white in color, whether it has to be fat or thin is all decided by the destiny. Even intellect is decided by the destiny. Ravindranath Tagore addressed the Supreme Lord in the National Anthem: Thou art the ruler of the minds of all people and the dispenser of India's destiny(Janagaṇamana-adhināyaka jaya he Bhāratabhāgyavidhātā). Therefore destiny prevails even for a nation. Wars and natural calamities affect a particular nation only due to that nation’s destiny. Who can change the lines of the forehead(destiny)? Several mysterious incidents took place in Ramayana. There is a lot of similarity between our lives and Ramayana. Ravana had abducted Sita very cunningly. It is the foolishness of several people that enabled him to do so. Lord Rama is an incarnation of God. Sita asked him to bring her a golden deer. A golden deer cannot be found in this entire Universe. Rama should have told His wife: "It is not a golden deer. It seems to be a golden deer but is an illusion." But did He do so? No. Is Rama a fool to run after a golden deer? No. But he acted thus at that point of time. Hardships are inevitable even to the Supreme God when He incarnates as a human being. Even we act so foolishly. Rama kept Lakshmana as the custodian of Sita and ran after the golden deer.But didn't Lakshmana also act so foolishly? The destiny is most powerful. Rama's running after a golden deer in order to fulfill Sita's desire,Lakshmana abandoning Sita inspite of having been assigned the duty of a custodian, Sita crossing the protective line of Lakshmana, enabled Ravana to abduct Sita. How can we judge who has blundered here? Who can change the lines of the forehead (destiny)? It is the destiny that drives your thinking faculty. This is very well depicted in Ramayana. Kaikeyi loved Rama more than Bharata. However a day before coronation, her mind changed. We think that Kaikeyi was influenced by her servant Manthara. Where is the rule that Kaikeyi must change merely by listening to Manthara? There was a probability that Kaikeyi might not have changed even after listening to Manthara. Rama told Lakshmana: "Kaikeyi is thinking in accordance with our destiny. Till date Kaikeyi had immense love for us. However today her love turned into hatred and therefore she wants to send us to forest. Perhaps there is some work to be done with this body in the forest and it has changed the mind of Kaikeyi accordingly. Kaikeyi got this thought only in accordance with our destiny. Therefore have no anger or hatred for Kaikeyi. It is only God's will, that will be fulfilled. Let’s abide by the same. Vali's consort Tara was very intelligent. She advised Vali not to fight against Sugriva for the second time. She said: "Just now Sugriva left after a humiliating defeat. But He is back immediately inviting you for a fight once again! I heard that these days Sugriva got acquainted with Rama and Lakshmana. Inspite of being defeated, His challenge for an immediate fight indicates that we have to act very cautiously now." Hence Tara advised Vali not to accept Sugriva's challenge for the second time. Vali replied: ' Oh! Tara, I accept that you are more intelligent than me. You are giving me a good advice. But I have a weakness. If anyone invites me for a fight, I cannot stay back at home. I cannot change my nature in this aspect. I would prefer either killing the enemy or being killed by the enemy but cannot stay back at home. Sugriva is my brother. Though I am capable enough to kill him, I am unable to get rid of my attachment for him. Though I may get a chance to kill him, I will only chase him but will not slay him down." But Tara replied: " You may not kill Sugriva but Sugriva has an external support. So you may get killed. Therefore you must not accept Sugriva's challenge for a fight." Vali said: "I heard that Rama is a gentleman and also very intelligent. I never had any enmity with Him. If Rama is a gentleman or God in a true sense, will He kill me? No. I can’t trust your words. "However, it was Rama who slayed down Vali. How can we judge who was right here? We can only conclude it to be the play of destiny. After Ravana was killed by Rama, Mandodari entered the battlefield. Lamenting over Ravana's death, she said in a deep distress: "Oh! Ravana, you are my husband regardless of being good or bad. You have been the most prosperous as well as one of the greatest kings. Oh! My dear husband, I can’t judge whether you brought Sita or a blazing fire to burn Lanka.Oh! Ravana, I gave you several good advices. But you never paid any attention. It is because 'The Destiny' is most powerful. The destiny pertaining to your body did not allow you to listen to my words. What could you do about it? Therefore Mandodari advised us: "Irrespective of your power and prosperity, your strength is insufficient to combat destiny." It was for quite sometime that I was trying hard to meet Sri Nannagaru. Because of poor health he was not coming to Hyderabad and work was not permitting me to go and meet him in Jinnuru. Finally one Saturday i called him and asked whether I could come and meet him in Jinnuru. The Mountain Path had published an article of mine Thank You God which taught the meaning of life to be Thankful to God at all times. As I clutched the book and traveled towards Jinnuru I understood why I was not able to meet him all these days. It was because it had been destined that I meet him with this book and show him the article. I went to his room where he was applying ointment to his body. He looked at me and gestured at me happily to come and sit in a chair opposite to him. He smiled at me and expressed his happiness and asked me about my journey. I replied to him and gave him the book with my article. He just glanced at the article and said and "this is Sharanagathi"
I smiled. He asked me about my recent trip to Singapore and then asked me to wait outside where he would come. I waited outside and saw some patients as Sri Nannagaru joined us. I have seen a very important facet of Sri Nannagaru regarding Patients. He would be very very concerned and would ask a lot of questions to me about their conditions and medications and their side effects. Once having asked me he would make it a point that I would communicate the same to the patients and also make double sure that the patients also understood the treatment and its side effects. He was a wonderful Communicator! After that he looked at me and said " How is your sadhana?" I have had spiritual experiences recently which I could only attribute to Sri Nannagru's Grace. "Without sadhana I am receiving your Grace" I replied truthfully. He smiled and then after some small talk about Singapore and my parents he asked me to go and take rest in the ashram room of his and come in the afternoon after lunch. One more thing about Sri Nannagaru is that he would be very particular that I take some tea or coffee when I visited his house. In the afternoon I returned to meet him and sat beside him. In a recent experience of mine in the early hours of waking I saw that the world was a thought and I was about to enter that thought. The world is nothing but a thought I felt. If I had no desire I would not enter the world and I would be in Peace I felt. But invariable I entered it and woke up. I narrated this incident to Sri Nannagaru and asked him its meaning. He said " The world and body is not separate. Both are the same. They are nothing but Thought." I asked "Is renunciation of thought...."
He paused and showed me some Muslims who had come to meet him. "They are devotees of Allah" he said. He gestured one lady to come forward and talked to her about Quran and other things relating to Islam. Sri Nannagaru replied " People call water by different names. Some call it jal some pani some call it tanni and some water. But its meaning is the same. Religions also are like that . All paths are true. There is no bearing of caste color or religion or country on the realization of Truth. Jesus said the Kingdom of Heaven is within us. Man seeks happiness. When man realizes happiness he gets unconcerned about gods and goddesses. As we identify ourselves with the body when we say 'I' so too we should naturally identify ourselves as the universal I when we refer to ourselves, then we attain peace and that peace results in Happiness. This should be realized either through the Gita, Quran or Bible. Tiruvannamalai is called Navadwarapuram. There are nine roads leading to it. Whatever road you take you will reach Tiruvannamalai. When Truth is realized the things of the senses appear distasteful. Attachments come when there is absence of renunciation." Sri Nannagaru then talking about a recent death of a devotee said " All things are predetermined"
It was time for me to go. He looked at me and blessed me and said "The Kingdom of heaven is within all of us. Remember this always"
I saluted him and took my leave.